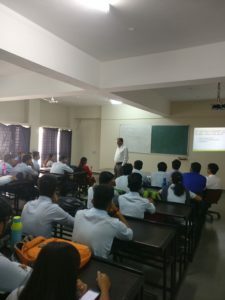 Expert lecture for BE CE-IV Year students by Dr. C.H. 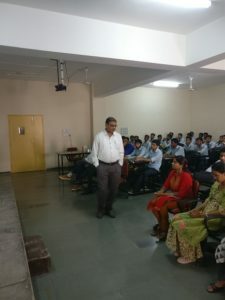 Solanki, Prof, Applied Mechanics Department, SVNIT SURAT on the topic ” Soil Properties, Investigations and Interpretations as Input for Foundation Engineering” on 12th Oct 2018. The expert lecture was organized to offer a platform for the students to get exposure to the concepts and interpretations of the field test of Soil. The application of the soil sample and the problems that are likely to be faced and the suggestive course of Improvement of Soil was discussed in detail. The tests that are carried out for the soil investigation, bore log data and its characteristics i.e. Borelog Depth, Spacing of Borelog, Location and the Size of Borelog was also discussed. The lecture was very interactive and was delivered in simple language for the students to understand easily. It was a learning session for all. The interpretation of the field results were explained as an Input for the Foundation Design.